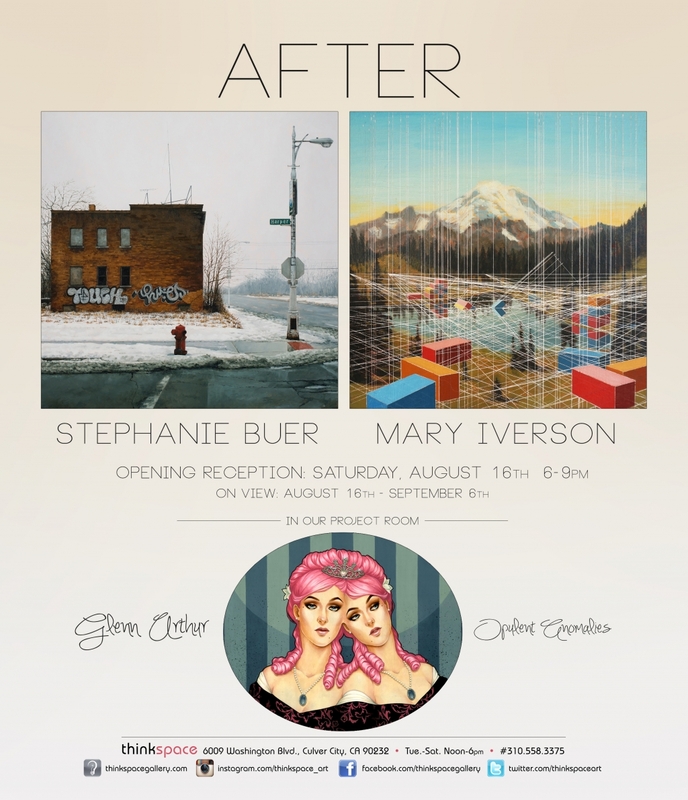 Thinkspace (Los Angeles) – is pleased to present After, featuring new works by Stephanie Buer and Mary Iverson. Portland based artist Stephanie Buer explores derelict and abandoned urban spaces in her meticulously detailed oil paintings and charcoal drawings. Looking to the barren architectural vestiges of industry, Buer explores the life of marginalized structures once they’re divested of function and condemned to vacancy and neglect. Buer is fascinated by the living histories of absence, and by the poetic solitude of remnants; these buildings, once brimming with purpose and commercial enterprise remain untenanted reminders of human desertion and waste. In keeping with this interest in the detriment of industry, Seattle based artist Mary Iverson imposes rigid manmade structures – stylized shipwrecks and toppling shipping containers – onto expanses of natural imagery. Her surreal paintings and mixed media works superimpose colorful geometric masses upon idyllic landscapes. Iverson’s works literally disrupt and obscure these vistas with fault lines and divisions, visualizing the exhaustive colonization of nature by the exploitative ambitions of industry. Both artists explore the end result of heedless development in unique ways. Iverson considers a potentially post-apocalyptic landscape in which human impositions have disastrous consequences, and Buer captures the haunting architectural legacy of relinquished space. Mary Iverson’s imagery was initially inspired by her fascination with Seattle’s port, and her observation of the massive shipping containers transacted there. The artist was struck by the imposing size and number of these cargo units, and the ecological implication of their global transport. Her works begin with realistically rendered landscapes of nature, executed in classical painting techniques reminiscent of the mid-19th century American landscape painters, which she then circumscribes with an uncomfortably enforced abstract geometry. Colorful rectilinear blocking flattens the depth of the landscapes, while graphic lines and grids seem like surgical excisions of its expanses. These pseudo-cartographies literally enforce the dismemberment of the natural landscape, visualizing its co-optation and disjuncture. The imagery is intentionally disconcerting, as Iverson creates a visual discomfiture to remind us of the detriment industry wreaks upon the natural world. With tumbling blocks and capsized structures, these calamitous geometries clearly threaten the existence of the landscapes they divide.